Here is another card that we made at club. It was totally a fan favorite because at this point I am pretty sure that I've convinced most of my gals that the Gorgeous Grunge stamp set is mandatory ... so they love it when I use it and combine it with other sets to provide lots of new ideas! Who would have thought that it'd be perfect for a Christmas card? I did see an initial idea on pinterest but I cannot read the font on the picture to thank them for the inspiration but once I started stamping I changed things up and used different colors, images and added in another stamp set all together too! One of the Project Life Holiday Cheer stamp set! Have you checked it out yet? 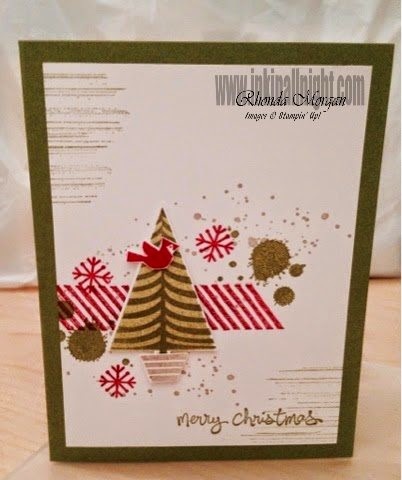 Labels: Festival of Trees, Good Greetings, Gorgeous Grunge, Holiday Cheer, INKin All Night!, Stampin' Up! Gift Box Class, sign up now! New SALE Coming to You! Gift Card Envelope & Card!